St. Demetrios gets new priest! Welcome Fr. George and family. Following the retirement of Father Michaels, St. Demetrios welcomes Father George and his family! Rev. George Parsenios was ordained a deacon in December, 2015 and a priest in May, 2016. He is an Associate Professor at Princeton Theological Seminary, where he teaches courses in Ancient Greek, New Testament and the interaction of early Christianity with the classical world. He has also taught at St. Vladimir’s Theological Seminary and the Pope Shenoude Coptic Seminary. He studied Classics at the University of Cincinnati (BA) and Duke University (MA) before earning the MDiv degree at Holy Cross Greek Orthodox School of Theology and a PhD from Yale University. 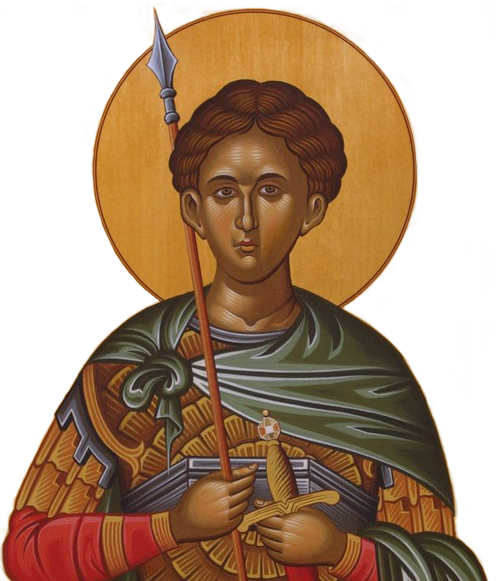 He comes to St. Demetrios together with Presvytera Maureen and their three children: Nicholas, Julia and Constantine. Father George may be reached at 609-462-2949 or at fr.georgepar@gmail.com. This entry was posted in News on June 15, 2016 by stdemetriosadmin. “St. Demetrios” icon by Filippos Konstantaras, used with permission.